Hi again! Lorene here, the blogger formerly known as just Lu. (The blog is still there, but the blogger isn’t as often :)) If you’ve been reading Housewife Eclectic for many moons, you might remember me from my Wednesdays on the Web posts back in the day. But this time, I’m here to share some fun projects with you to give Debra a little break and some time to snuggle that sweet baby girl! These are so easy and customizable! Just cut the designs you want out of the vinyl and stick it on! If you don’t have a cutting machine, you can cut simple shapes by hand easily with an x-acto knife. I used glossy outdoor vinyl since it has a stronger adhesive, but any kind of vinyl, or even contact paper, should work. I used some of my favorite Doctor Who designs and sayings, traced in Silhouette Studio. I also customized some simple white thumbtacks with teeny tiny Cybermen, Adipose, Daleks and of course, a TARDIS! When you’re looking for images that you want to hand cut or trace digitally, try searching for coloring pages and stencils — they’re generally simpler and easy to trace. Have fun and I’d love to see what you create! LoreneLu (or Lorene if you prefer) is the mom of 3 kids and wife of a singing and dancing elementary teacher. She happily shows up here at Housewife Eclectic whenever Debra allows, and occasionally blogs on whatever topic comes up over at her blog, just Lu, when she has time in between projects and her awesome job as a virtual assistant. Those are such a cool idea for Dr. Who fans! Very creative! My son loves Dr. Who! 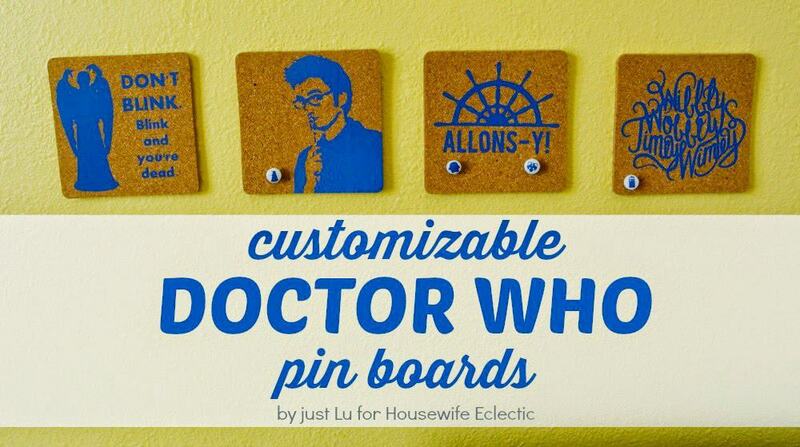 What a great idea for Whovians! I'll have to share it with some die hard fans in my life. 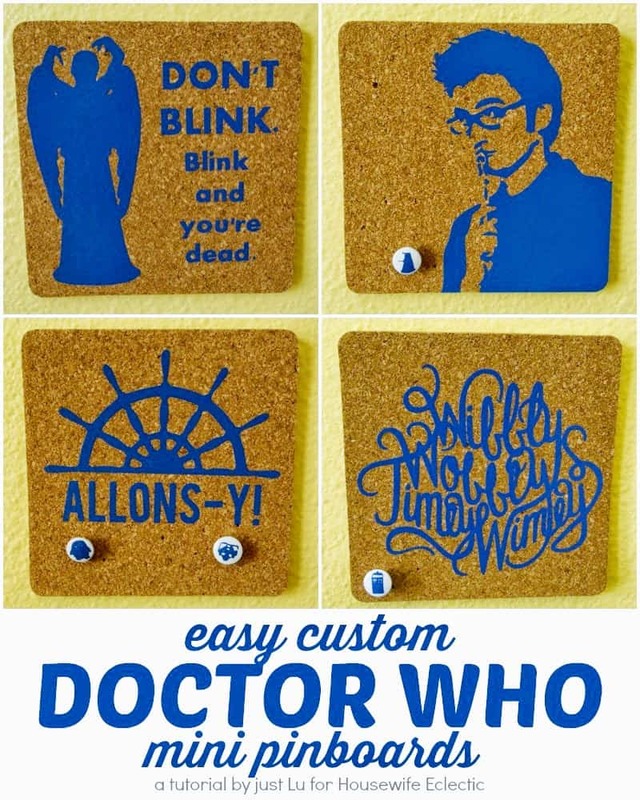 That is a really cool idea.. using cork is great cause it has so many uses.. Dr. Who.. memories! Wow, thanks for sharing this. I'm a Doctor Who fan. I might do it. Those are so cool! What a super creative idea! I'm not a Dr. Who fan but what a fun and creative idea for those who are! Nicely done. I'm not a Dr. Who fan but this is such a cool idea! That is awesome! My husband is a die hard Dr. Who fan and has been since he was a kid. He would love these!